Although the submergent Kerguelen Plateau (KP), a large igneous province in the Southern Indian Ocean, was initiated after the rifting of India from Antarctica, i ts construction, fed by the Kerguelen hot spot, has taken place over the past c. 114 m. y. 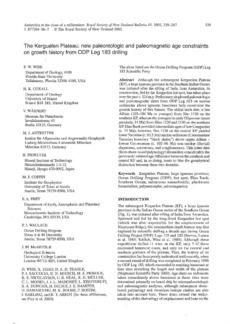 Preliminary shipboard paleontologic and paleomagnetic dates from ODP Leg 183 on marine sediments above igneous basement help constraint the growth history of this feature. The oldest such date is late Albian (105- 106 Ma or younger) from Site 1136 on the southern K.P, whereas the youngest is early Oligocene (more precisely, 34 Ma) from Sites 1139 and 1140 on the northern KP. Elan Bank provided intermediate ages of late Campanian (c. 75 Ma); however, Site. 1 138 on the central KP yielded lower Turonian (c. 93.5 Ma) marine sediments (Cenomanian/ Turonian boundary "black shales") above upper Albian - lowest Cenomanian (c. 102-96 Ma) non-marine (fluvial) claystones, sandstones, and conglomerates. This latter date (from shore-based palynology) diminishes considerably the previously inferred age difference between the southern and central KP and, in so doing, tends to blur the geophysical distinction between these two domains.